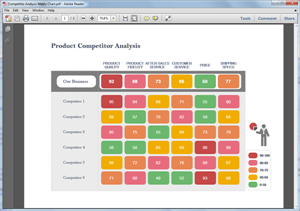 This page offers you a number of ready-made competitive analysis templates which are easy to edit. The templates can be exported to Word, PPT and PDF. Competitive analysis is a vital part of company marketing and strategic planning. Usually tables and charts are used to conduct competitive analysis. As a professional chart maker, Edraw has included lots of presentation quality competitive analysis templates. With powerful export features, you can use the templates in PowerPoint, PDF or Word, with no quality loss. 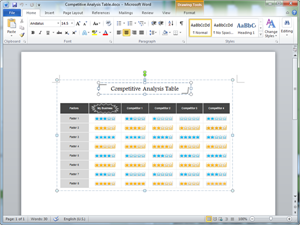 Creating a competitive analysis diagram is super easy with Edraw's predefined templates and vector symbols. You can either choose a ready-made template or use the drag-and-drop way to start. It takes only a few minutes adding shapes, changing colors and inserting texts. After you finish editing the chart, go to the File menu and click Export & Send button, you can turn your document to MS PowerPoint presentation. 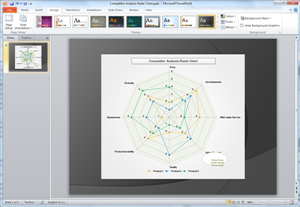 The competitive analysis chart will remain editable in PPT. As the customizable competitive analysis templates we offered are in EDDX format, you need to download Edraw to open or edit a template. The can be edited by means of changing color, content, theme and effect. To export the file to PDF is easy. One click on the Export button will save the file as PDF format. 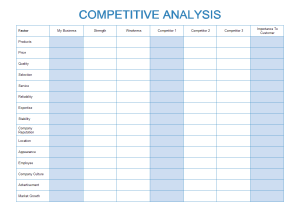 You can view the PDF Competitive Analysis Template to view the quality. Discover why Edraw is an excellent program to create competitive analysis. Try Edraw FREE.